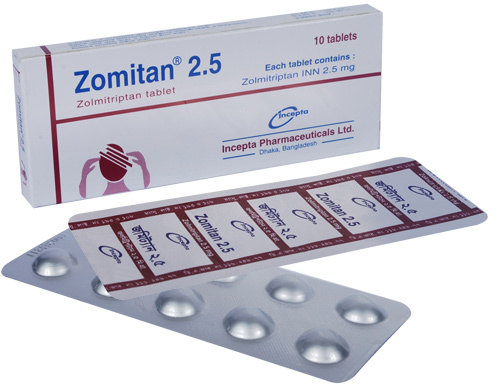 Zomitan 2.5 tablet: Each film-coated tablet contains Zolmitriptan INN 2.5 mg.
Zolmitriptan is an antimigraine agent. It binds with high affinity to 5-HT1B/1D receptors. The therapeutic activity of Zolmitriptan for the treatment of migraine headache can most likely be attributed to the agonist effects at the 5-HT1B/1D receptors on intracranial blood vessels and sensory nerves of the trigeminal system which results in cranial vessel constriction and inhibition of pro-inflammatory neuropeptide release. Zolmitriptan is rapidly and well absorbed after oral administration. Zomitan 2.5 is indicated for the acute treatment of migraine with or without aura. The recommended dose of Zolmitriptan to treat a migraine attack is 2.5 mg. If symptoms persist or return within 24 hours, a second dose may be taken not less than 2 hours after the first dose. The maximum dose of Zolmitriptan in 24 hours is 10 mg. Zolmitriptan is equally effective whenever the tablets are taken during a migraine attack; although it is advisable that Zolmitriptan tablets are taken as early as possible after the onset of migraine headache. Patients with hepatic impairment: Patients with moderate or severe hepatic impairment a maximum dose of 5 mg in 24 hours is recommended. Patients with renal impairment: No dosage adjustment required. Use in children: Safety and efficacy of Zolmitriptan in paediatric patients have not been established. Use in elderly patients: Safety and efficacy of Zolmitriptan in individuals aged over 65 years have not been systematically evaluated. Zolmitriptan is well tolerated. Adverse reactions are typically mild/moderate, transient, not serious and resolve spontaneously without additional treatment. The most commonly reported adverse effects are nausea, dizziness, somnolence, asthenia and dry mouth. Disturbances of sensation have also been reported. Heaviness, tightness, pain or pressure may occur in the throat, neck, limbs and chest (with no evidence of ischaemic changes on ECG). Zolmitriptan should only be used where a clear diagnosis of migraine has been established. Care should be taken to exclude other potentially serious neurological conditions. There are no data on the use of Zolmitriptan in hemiplegic or basilar migraine. Zolmitriptan should not be given to patients with symptomatic Wolff-Parkinson-White syndrome or arrhythmias associated with other cardiac accessory conduction pathways. In patients with risk factors for ischaemic heart disease, cardiovascular evaluation prior to commencement of treatment with this class of compounds, including Zolmitriptan, is recommended. Pregnancy: There are no studies in pregnant women, but there is no evidence of teratogenicity in animal studies. Zolmitriptan should be used in pregnancy only if the benefits to the mother justify potential risk to the foetus. Lactation: No data exists for passage of Zolmitriptan into human breast milk. Therefore, caution should be exercised when administrating Zolmitriptan to women who are breast-feeding.